Win: Me And Earl And The Dying Girl - A heartwarming indie gem | SWITCH. Winner of the Grand Jury Prize and the Audience Award at the 2015 Sundance Film Festival, 'Me And Earl And The Dying Girl' is the uniquely quirky and moving story of Greg (Thomas Mann), a high school senior who is trying to blend in anonymously, avoiding deeper relationships as a survival strategy for navigating the social minefield that is teenage life. He even describes his constant companion Earl (RJ Cyler), with whom he makes short film parodies of classic movies, as more of a "co-worker" than a best friend. When Greg's mom (Connie Britton) insists he spend time with Rachel (Olivia Cooke) - a girl in his class who has just been diagnosed with cancer - he slowly discovers how worthwhile the true bonds of friendship can be. The 'Me And Earl And The Dying Girl' competition has now closed. Winners will be announced shortly. Competition opens at 5pm AEDT on Sunday 10th January 2016 and closes at 11:59pm AEDT on Sunday 17th January 2016. Five winners will be chosen at random on Monday 18th January 2016. To successfully win, entrants must fulfil the above entry conditions before the time the competition closes. Current members/followers are eligible to enter the competition. Only one entry per person. Only one winner per household. To be a valid winner, the entrant must not have won a prize from SWITCH within the last 28 days. 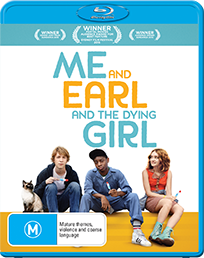 Each winner will receive one Blu-ray copy of 'Me And Earl And The Dying Girl'. By entering, you agree to receive occasional emails from SWITCH in the future. If you decide to unsubscribe from these updates, any further entries will not be applicable. Only Australian residents are eligible to enter. 'Me And Earl And The Dying Girl' is available on Blu-ray, Digital HD and DVD on Wednesday the 13th January 2016 from 20th Century Fox Home Entertainment.